In a typical situation, the colocation will provide the physical security, power, building, and cooling while the consumer provides the servers, and the storage. The space in a colocation facility is rented or leased by the room, cage, cabinet or rack. 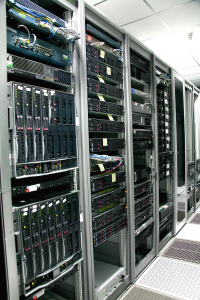 Several colocation facilities have also included in their services the ability for the business to purchase managed services for their servers and computer hardware. There are several explanations on why a business decides to use a colocation facility over constructing their own data center. The main reason is because of the cost that accompanies constructing a building, preserving and modernizing a huge computing facility. Historically, colocations were used by private businesses in order to minimize disaster recovery. In today’s world colocations are used more and more by cloud service providers. While typically colocation consumers will provide for their own storage and systems, many facilities offer managed colocation services and as such must look at and deploy platforms and systems which are unified in order to provide increased efficiency, and thus reduce over-all costs. Using computing solutions which are high density they are able to offer more power within a smaller chassis.Going from the smaller chassis, server administrators are then able to put more consumers and higher workloads on a reduced amount of servers.Utilizing SSD and flash controllers’ server administrators have been able to cut the operating costs of storage. Using flash storage not only saves on costs but also aids in saving energy and space. This technology is still somewhat limited in deployment. The arrays are still a little pricey, and there has been some concern over using this technology for the long haul. Still SSD and flash are incredible technologies which are being utilized. The idea of going to green technologies has often been thought to be expensive, however,as technology advances this thought process is changing. Data centers are beginning to see that if they go green they will actually save some green. • Low power servers – These servers typically use only 10 percent of the power and 10 percent of the space. • Supporting the creation of low energy yet powerful integrated devices by using Memristors. As we move forward, it will become increasing important for colocation data center administrators to incessantly advance in the use of modern technology in order to stay in front of their competition. This entry was posted in Colocation and tagged colocation, rack servers on January 9, 2014 by admin.